Where did our family name “Garon” come from? I don’t know and it may not matter, since our family name isn’t really Garon. At the outset I would like to dispel the myth that Garon was a rhyming derivation of Karon/Kaner/Kenner. The Garon “connection” to Karon/Kaner is via marriage. The earliest connection was Pesha Berkowitz (Baykovich/Bicovitz/Bicovitch) married Simcha Zimel Garon, while Pesha’s sister, Chia/Ida Berkowitz married Sabsa Shalom Sam Kaner. 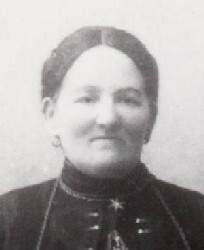 Later Israel Garon married Hannah Mary Kaner, and Moses Garon married Pessa Hannah Simon (daughter of Rose/Sarah Rochel Kaner). Similarly, Garon is not a derivation of Coran. Pesha and Chia/Ida Berkowitz’s brother (or cousin) was Reuben Berkowitz. His daughter was Lena Freda Berkowitz who married Abbe Akir Coran. This explains why the three inter-connected families from Kavarskas, Sirvintos/Shirvent, Bagaslaviskis and Musninkai, Lithuania (Kaner, Coran, Garon) all settled together in Duluth, but it doesn’t help us understand the origin of the name Garon. So, how did we get the name, “Garon”? Throughout Jewish history, Jews didn’t have last names (surnames) rather they used a patronymic system. A person was known by their first name and “son of” or “daughter of” (bar or bat). Example: Moshe son of David/ Moshe bar David. Except for aristocrats, wealthy people and well off Jewish merchants did not get surnames in Eastern Europe until the Napoleonic years of the early 19th century. Most of the Jews from countries captured by Napoleon including Russia, Poland, and Germany were ordered to get surnames. The reason for the last names was for tax and military conscript purposes. When Jews adopted family names in the 18th and 19th centuries, the choice was frequently the patronymic, and first names thus became family names. A perfect example of this is Simcha Zimel Garon’s wife. Her name was Pesha Berkowitz (daughter of Tevya Osher and Bailla). “Berkowitz” means "son of Berko", in Yiddish, derived from Hebrew- Baruch. So presumably, Tevya’s father or grandfather’s name was Baruch. In other cases, Jews took the names of their occupations, or physical or character traits, or the town or province they were born in or lived in, or a descriptive of the head of the household. Other names have a more historical foundation, such as names reflecting cohen, israelite and levite ancestry. Garon (גרון) from the Hebrew means “throat”. We can only guess why this name was chosen. But at the outset, I pointed out that our “real” family name isn’t Garon. Our “real” family name is Suster. This is a derivative of Shuster (שוסטר)-German origin for “shoemaker”. How do we know this and why hadn’t anyone in the family hear about this before? I do remember my grandfather, Harry Heifetz (son of Freidal Garon) telling me that the family name wasn’t Garon, but I was too young to remember (or care) what he told me the real family name was. I first heard this story from Myrrle Garon, Uncle Abe Garon’s daughter, who lived in California and died in 2002. As she told it, the original Garon in our family was in fact a boy born to a family, whose name she pronounced "Sistreen", and that he had been adopted by the Garon family to protect him from conscription into the Russian army. In those days, first-and perhaps second- sons were exempt from conscription, but later sons were not. I told this story at a family party, but nobody there had ever heard of it. This spurred me on to ask about the story more widely. 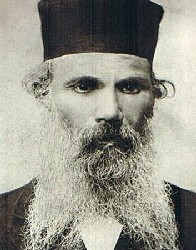 Robert Garon, the son of Myrrle's brother, Milton also had heard that the original name was not Garon, but he believed that the names had been switched at Ellis Island. It turns out that the story is well-known in Uncle Morris Garon's family! His grandsons Andy, David, and Al have all heard of it. Andy heard it from his father Sidney and grandfather, Morris. As Andy told it to me, the original family name was "Shuster" or "Shusterman." The "Shusters" paid someone to fix the records, so that the young man's new name would be official. So I take the story as true, though there are still many unknowns: Which Garon was the first? Could it have been Simcha Zimel, our great-grandfather? Was there a "real" Garon family? With the information from Steve Samuel’s letter in hand, I did some further investigation. Here are documents I found which support Steve Samuels oral history. Below is the marriage record of Zimel Suster (Simcha Zimel Garon) to Pesha Baykovich (Pesha Berkowitz). On the marriage document, note that Simcha Zimel’s last name from this 1869 record is Suster and he had a brother Shmuel Suster that was married in 1870. The fact that there were at least two Suster brothers fits well with Steve Samuels story. 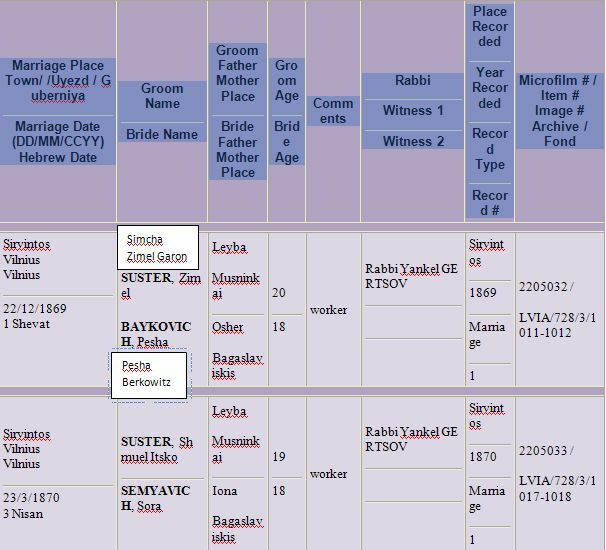 The following record shows that Freidel Garon (my great grandmother) was not the first born child of Simcha and Pesha as we thought; rather they had a daughter Leya that was born in 1870, 10 months after they were married. 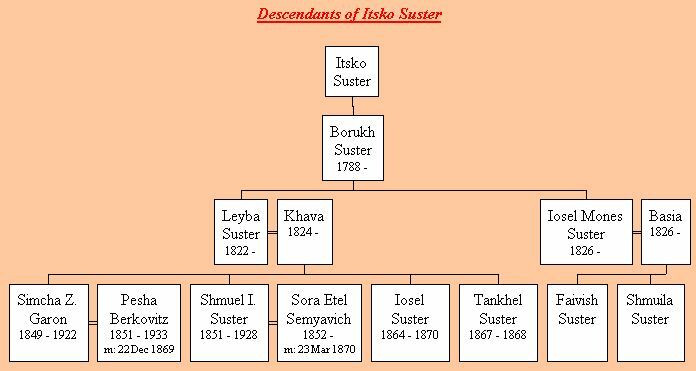 The “Suster” family name was still being used in 1870 (Simcha Zimel would have been about 21 years old at this time). 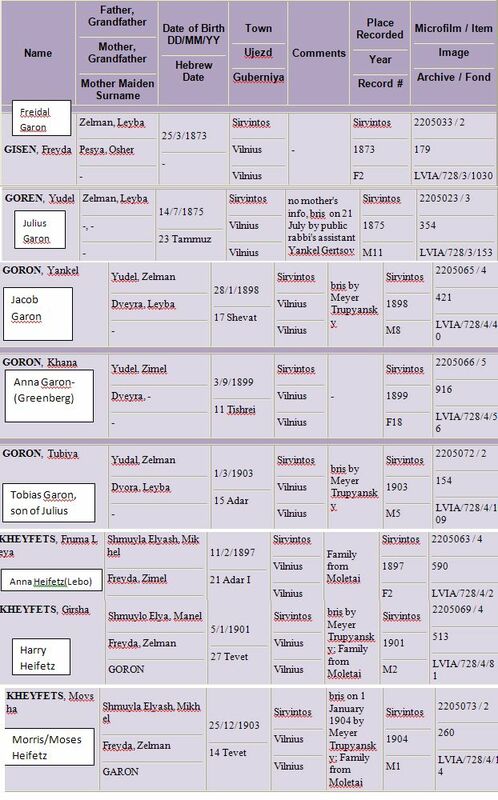 Below is a composite of birth records from some of Simcha Zimel/Zelman and Pesha’s children or grandchildren. Note the name change to Garon (or some similar transliteration from the Hebrew) began in 1873. We can see the transition from Suster (or Shuster) dating from at least the mid 1700’s to Garon in the late 1800’s. So what is our real name, and does it really matter? After all, we are indeed one family. Yes, according to our decades-long research there both was and still is a “real” Garon family. We trace our roots back to “The Imperial Territory of Alsace-Lorraine”. Further back beyond that, the family of origin was located near Lyon, France. Generally speaking, we consider ourselves to be more “French” than “German”. My 88-year-old father, who is a retired university professor, has spent 50+ years researching our family history. So far, he has been able to directly trace our Garon family ancestry positively back to the mid-to-late 1400s. The search continues. Michael is from a different Garon family, or at least, one to which we have not yet found a connection. Click here to see the full text of what Michael submitted.